An everyday occurrence spotted when we turn on the tap to brush our teeth has baffled engineers for centuries—why does the water splay when it hits the sink before it heads down the plughole? Rajesh Bhagat, a Chemical Engineering Ph.D. student at St John's College, University of Cambridge, and first author of the paper, fired jets of water upwards and sideways onto flat surfaces, and witnessed exactly the same hydraulic jumps as those when the water flowed downwards. But what was causing it? 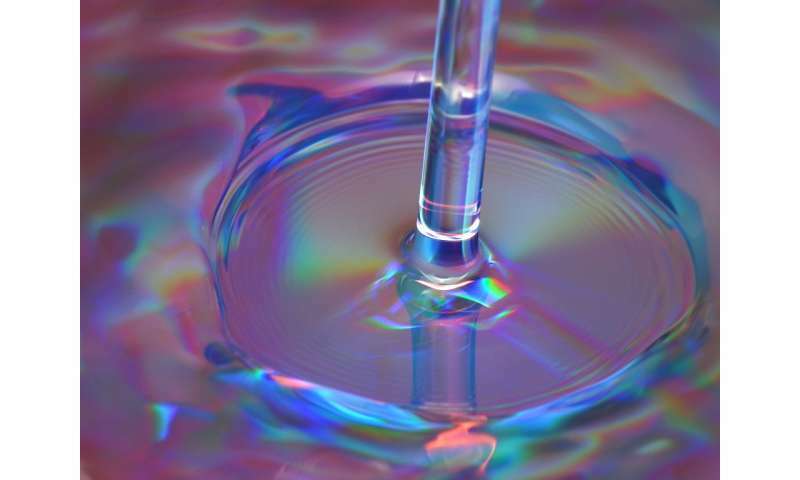 Bhagat suspected they could all affected by the same factors—surface tension and viscosity. By altering these attributes of the water he was able to accurately predict the size of the hydraulic jumps, regardless of which direction the water was moving—debunking the 200-year-old gravitational theory as the cause of a kitchen sink type hydraulic jump. This kind of hydraulic jump is known as a circular hydraulic jump. Isn't the effect not a bit similar to the effect of stopping a boat hard in a canal and causing a much larger wave to travel ahead of it as a result, in terms of the sudden increase in wave energy? The velocity of a pebble dropped into water slows abruptly as it sinks before gravity takes it more slowly to the bottom, and the reduced pressure of the channel it gouges into the water behind it combined with the increased pressure of the water it is pushing ahead of it causes that water to be literally sucked up behind it with enough force to create a small fountain ..kind of a combination of two ideas, when Bernoulli is factored in. The cause of hydraulic jumps has been known for the last 150 years, and it isn't gravity. Duh. funny it never happens in non polar fluids. to demonstrate how ignorant and closed minded the physics community is ... when asked if hot water freezes faster than cold water ... no one ever asked if it melts faster. it does.. packing fraction differences based on the speed of the molecules .. haste makes waste.